Wednesday evening Evan and I went to a screening of Milk - Gus Van Sant's new movie on the story of Harvey Milk, the first openly gay supervisor of San Francisco. The movie was a tad long for my tastes (2 hrs) - for such an intense story (although they may cut/add footage before it actually hits theaters), but the character details/personalities were really well done. Sean Penn was AMAZING, and by the end of the movie I was choking back tears while others in the theater were definitely crying... I also really appreciated the performances/characters played by Emile Hirsch and James Franco. This was the first time I have been to a screening of a movie where they're polling to find out people's reactions to the movie with an eye towards what might be changed. 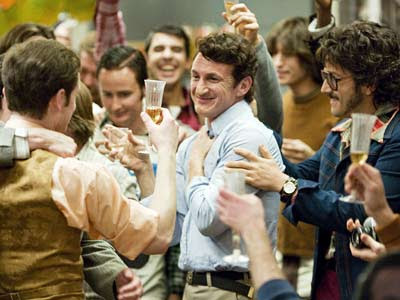 The staff went around polling people before the movie to see how much we knew about the story of Harvey Milk, what was drawing us to the film (the actors? the story? ), and how excited we were to see the film. Evan and I were asked to stay after the movie with a group of 20 or so others to comment more specifically on the film. Their criteria for choosing us was based on our answers to one question: "How excited are you, on a scale from 1 to 10, to see this movie?" I immediately asked what the scale endpoints (anchors) were, but the lady acted as though it was pretty self-explanatory. So I said 6 and ev said 7. I guess that was low compared to the rest of the crowd... but they could have had different anchors (i.e., 1 could have been "OMG get me out of here" or "Not that excited"), different social comparisons (am I excited compared to most people or compared across all movies I want to see?). The session afterwards felt like a replication of Asch's study. The interviewer would ask, "How many people rated this film as 'excellent'? (she'd count)Ok, so only one of you didn't rate it as 'excellent'" And then she'd ask people to explain themselves. It just didn't feel like a very valid way of assessing reactions.